I use ggplot2, gganimate, ggthemes anad tweenr for customizing the figures. I start with data downloaded from FAO’s website, specifically the “Total Production” dataset CSV. One problem with using this dataset to understand how seafood production from wild capture (i.e. wild-caught from the ocean) and aquaculture (farmed, not wild) has grown over time, is that this data does not differentiate between fish caught for consumption versus non-consumption (e.g. fish used for feed). By using a second dataset on global food supply of seafood, I can calculate the amount of fish caught for consumption. Why not only use this dataset? Because this one does not differentiate between wild capture and aquaculture. If you’re interested in the data I used, here is a screenshot of the manual query on FAOSTAT. I am still hopeful that someone, somewhere will create an FAO R package that lets me query all of their data directly from R. In the meantime, I’ll wrangle these two datasets together as best I can. 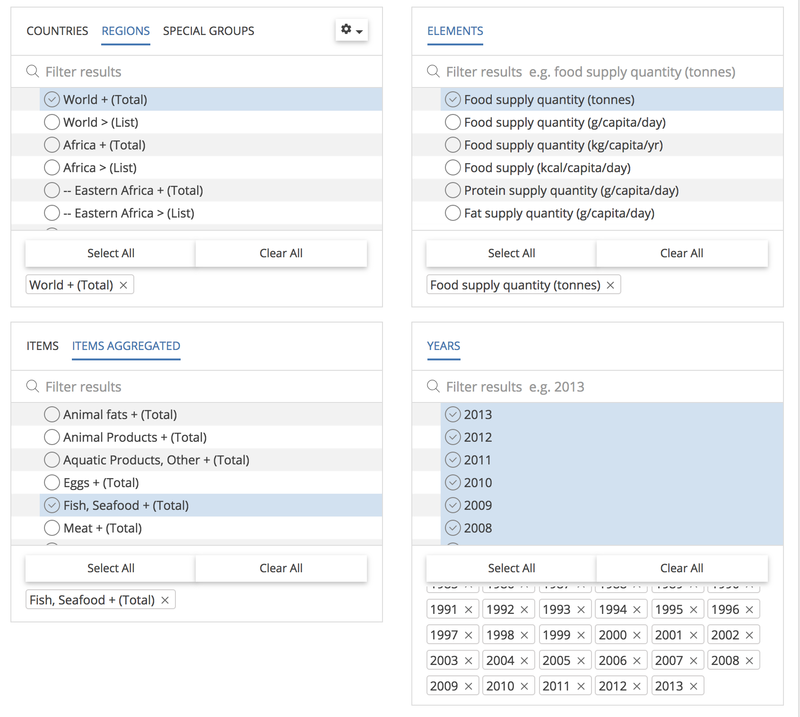 Since no dataset from FAO has exactly what I want, I can take the seafood dataset, calculate total production (tons) per year, and then remove the total aquaculture production for each year calculated from the fao dataset. 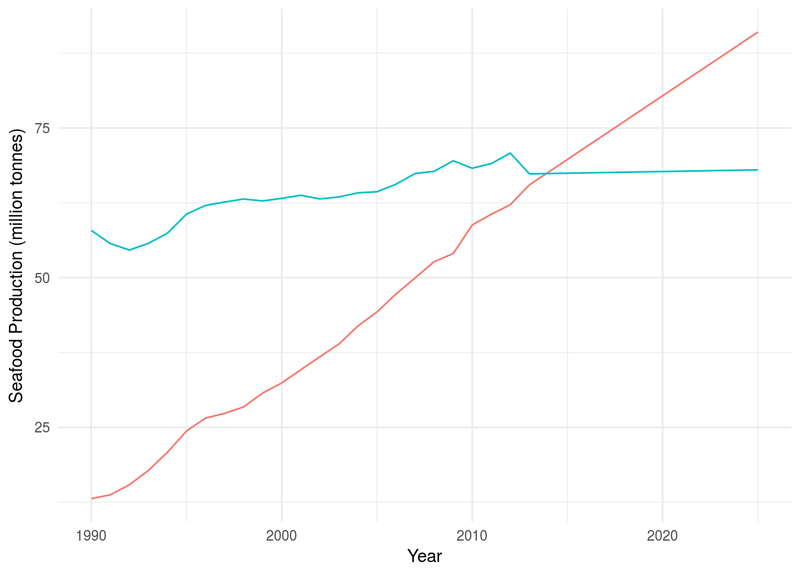 Then I have wild capture seafood per year (from the seafood dataset), and aquaculture production per year (from the fao dataset). Source == 4 ~ "Wild_Capture"
The data only goes to 2013, but I want to include forecasted growth of these two sectors. The 2016 State of the Worlds Fisheries and Aquaculture report projects a 39% growth in Aquaculture production and just a 1% growth in Wild Capture. To make this easy, I simply used the 2013 production values and set the 2025 values to 139% and 101% of those values. I create two new dataframes, one for all years 2014-2024 with two years full of NA, one for Aquaculture and one for Wild_for_food (Wild Capture). The second is a one row dataframe for the year 2025 with the Aquaculture and Wild_fod_food values equal to 139% and 101% of their 2013 values respectively. Using the zoo::na.approx() function I simply do a linear interpolation of production values between 2013 and 2025. Notice I renamed the columns to x, y, id, and time. This is for use in the next section with tweenr. The x column identifies what I want on the x-axis (years), y identifies the y-axis (tons), id identifies the different series for plotting (Aquaculture or Wild_for_food) and time is used to tell tween_elements() what the different time points will be for interpolation. The ease column will tell tween_elements() what the easing (or interpolation) function will be. In this case, I just want a linear interpolation between my datapoints. You can animate a static ggplot just with the gganimate() package. To make the animation smoother, I’m using the tweenr package. Specifically, the tween_elements() function creates a new dataframe with interpolated points between your datapoints (called “tweens” !) allowing gganimate to plot all these points one after the other, resulting in a smooth dynamic visualization. The nframes argument allows you to set how many total timepoints you want. I played around with this and chose 100 because I thought it gave the right speed. The more nframes, the more points to plot and thus the slower the visualization. I suggest just playing with this argument until the animation looks right to you. After creating the new dataframe with tween_elements() you use ggplot and gganimate to create the final animation. tween_elements(., "time", "id", "ease", nframes = 100) %>%   #using tweenr! I spent a lot of time messing with the text sizes, colors, label placement, etc. I also learned how to add an arrow (thanks, geom_segment()). While I could keep tweaking this forever, I think it’s good enough as is. The whole process of learning how to use tweenr took me just a couple hours and I’m excited for the next opportunity to make something like this!